Are you tired of obsessing over someone who has hurt you or a loved one? Does the pain and resentment of a past or present relationship cause you ongoing distress? Do you have a gnawing pain that you have not resolved as a result of a conflict or ending of a relationship? When you’ve experienced the deep pain of conflict or a relationship ending, you know inside your heart that forgiveness will help you feel free and light, willing to live your life again. The problem is you cannot see your way to forgiveness on your own. We have heard that forgiveness is essential for self-care. In fact, it is the ultimate in caring for our whole being. It provides us with freedom and peace. It opens the space inside of us to direct our energy to live our life purpose: to live in joy. But when we are in the thick of a disagreement, or when we find ourselves left by someone we thought would stay by our side forever, forgiveness is the last thing on our mind. 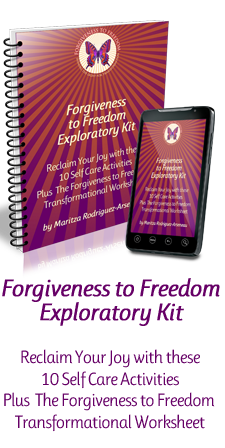 My name is Maritza Rodriguez-Arseneau and I founded Forgiveness to Freedom to offer a gentle and powerful method for forgiveness. Are You Ready For a Whole New Life Paradigm For Living in Self-Empowerment and Peace? I work closely with you to identify the source of your pain and break through the barriers of resentment so you can reach your full human potential and live your best life. Forgiveness is not about letting a person deny their responsibility, minimize or justify their wrong doing. Forgiveness is a decision to let go of the resentment and lesson the grip of the act that hurt you. The first step to freedom is to identify what relationships are holding you back from joy and then to work toward forgiving those people. To get started, use the form on the right to access your “Forgiveness to Freedom Worksheet.” When you have filled out the Worksheet to the best of your ability, we will get together for a Complimentary Forgiveness to Freedom Strategy Session. Together we will review and identify the situations and people that need to be forgiven and come up with the plan to free you of your pain and allow you the strength and freedom to follow your dreams. Yes to the life I envision! Welcome to the new Forgiveness to Freedom Blog!! !